Remaking home landscapes with attractive native plants can do essential work in the fight to reverse human-caused wildlife loss. Spicebush swallowtail caterpillar on a spicebush leaf. On Saturday, the local land conservation group Grand Prairie Friends will conduct a sale of native prairie and woodland plants inside Lincoln Square in Urbana. This sale represents the best opportunity of the year for residents of east central Illinois to get their hands on a wide assortment of native plants at very reasonable prices—and to support broader conservation efforts at the same time. The sale starts at 8:00 Saturday morning and runs until noon. In recent years, people have grown passionate about planting milkweed in home landscapes, and the sale offers three different milkweed species to choose from. Why all the milkweed? Asclepius is the only plant genus on which the caterpillars of monarch butterflies feed and develop. Knowing that monarch populations are in trouble, people here and across the country are doing what they can to create monarch havens in their own back yards. In this, I sense an opportunity. That’s because I think people who are willing to plant milkweed for monarchs might also be persuaded to favor wildlife more generally as they decide what to plant in their yards. That is, they might also be persuaded to plant attractive, native shrubs, such as New Jersey tea or spicebush instead of alien butterfly bushes, and to plant native oak and crabapple trees rather than their exotic cousins. There are really cool rewards in doing so, especially for people interested in observing wildlife. 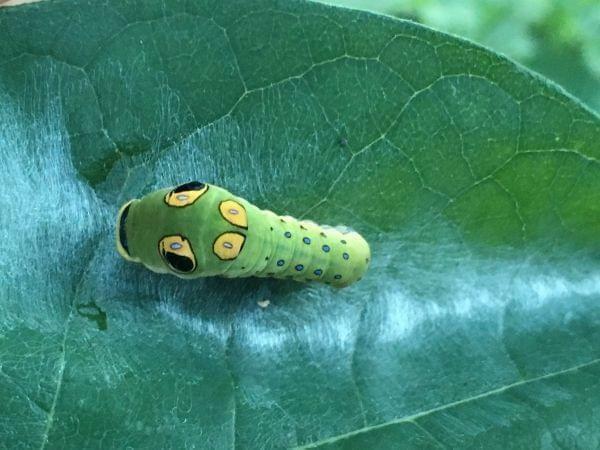 For example, I had seen photographs of the caterpillars of spicebush swallowtail butterflies before, but I never saw one in the “wild” until I found them last summer on a spicebush planted in my yard. The impact of planting native shrubs and trees can be even greater. Consider a white oak tree planted in the right place. After keeping it watered for the first year or two, the person who plants it can walk away with some confidence the tree will outlive her, and perhaps her children. Over that time, the white oak will support the caterpillars of as many as 500 species of moths and butterflies, which, in turn, will serve as food for dozens of species of birds. Among those will be warblers, the tiny, quick, colorful favorites of birders. The warblers we see in east central Illinois, winter in Central and South America and then migrate to or through the Midwest in spring, and they depend entirely on insects for food. My understanding of the importance of landscaping with native plants comes from Douglas Tallamy, currently professor and chair of the department of entomology and wildlife ecology at the University of Delaware at Newark. In the book, Bringing Nature Home: How You Can Sustain Wildlife with Native Plants, he explains that we’re mistaken to think we can support healthy wildlife populations by means of the relatively small amounts of public land set aside for that purpose. “As far as our wildlife is concerned,” he writes, “we have shrunk the continental United States to 1/20th its original size.” A straightforward ecological calculation tells us that little fragment will support only 5% of the species that were found here when Europeans first arrived. So, when you think it through it’s not just helpful but absolutely necessary to begin remaking our urban and suburban landscapes with native plants if we hope to reverse current trends toward extinction in wildlife. And this is the fun, easy part. Details about the native plant sale on Saturday are http://grandprairiefriends.org/plantsale2017.php.